If you love a creamy yet non-greasy cleanser that produces soft lather, Skin Balancing Oil-Reducing Cleanser is the perfect solution. This cleanser is formulated for oily/combination skin and works perfectly to remove excess oil and all makeup without stripping skin. 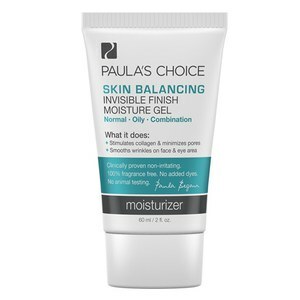 Skin Balancing Oil-Reducing Cleanser has a pearlescent texture and cushiony foam that treats your skin gently while offering thorough cleansing. Removes excess oil and makeup without stripping skin. Splash the face and eyes generously with tepid to slightly warm water. Apply a small amount of cleanser to your face and eye area with vigorous yet gentle circular motions. Rinse well. Repeat or use with a clean washcloth to remove heavy makeup. Follow with the appropriate Paula's Choice toner to give your skin a generous amount of potent antioxidants and skin-renewing ingredients. Water, Sodium Lauroamphoacetate, Sodium Cocoyl Isethionate, Stearic Acid, Glycerin, Glycol Distearate, Helianthus Annuus (Sunflower) Seed Oil, Acrylates Copolymer, Cetearyl Alcohol, Aloe Barbadensis Leaf Extract, Sodium Chloride, Sodium Hydroxide, Xanthan Gum, Caprylyl Glycol, Hexylene Glycol, Disodium EDTA, Phenoxyethanol. I've been using this cleanser for a very long time and loving it a lot. It has a good effect on reducing my pores and even before i use my pore reducing toner i can see my pores are minimized after using this cleanser. I've been a huge fan of Paula's Choice line for a while now and this has been a cult favourite of mine. If you have a combination skin like mine and struggle with pores i definitely recommend for you to try this out.. I have been using PC for a couple of years and it is great for my skin, and a good value. Her BHA products in particular have really helped my oily/combo light olive complexion.This product lathers well and cleans off my makeup. A VERY small amount is all that's needed.